1) Like the vast majority of shark species, cookie cutters are only wee. They grow to around 40 cm in total body length, and don’t hold much clout at the bloated floating carcass when the big bitey species turn up for dinner. 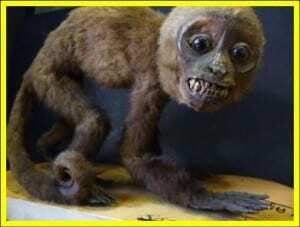 Nevertheless it is an im-press-ive animal. 2) Has your conscience ever toyed with the idea of turning you vegetarian, but you just can’t give up the idea of a good, fat, juicy steak? (My mouth is watering). Or maybe you don’t care for meat but can’t be fuddled with checking the ingredients of every pig damned food packet? 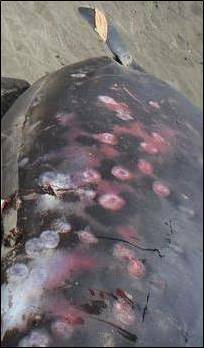 What you need dear reader, is a lesson from the cookie cutter shark in being a facultative ectoparasite. Oh yes. Cookie cutter’s have a wonderfully eco-friendly method of being carnivorous that does not require a type of predation that results in fatalities. 3) Fatalities it does not require, but a finely tuned, exquisite looking set of gnashers, it does. But let us be chronological in the chain of events required to ectoparasitically munch on your dinner. First, like cookie cutter sharks, you need a set of lips specialising in suction. Stop that. Cookie cutters attach themselves to the side of their chosen prey species, such as a whale, and hold on by sucking. Next you get out your knife and fork. 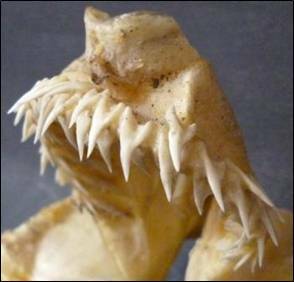 In their upper jaw the cookie cutter has around 35 needle-shaped teeth that stick into the flesh of the prey like a fork. 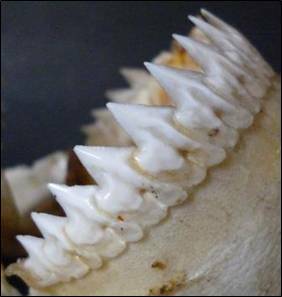 On the lower jaw are around 20 highly serrated triangular teeth that act like a knife and, cut. The shark will attach itself to the prey animal with lip-suction, (lip-suction, not lipo-suction, that’s different), grip the flesh with its ‘fork’ teeth and then cut with its ‘knife’ teeth, as it simultaneously spins its body. This ballet of coordination creates a cookie-shaped plug of flesh which it removes before letting go of the prey. Job done, shark’s fed, prey survives, everyone goes home happy. 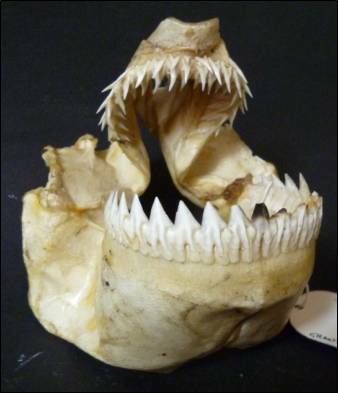 4) All shark species are polyphyodontic, meaning that they continually shed their teeth throughout their lives. As the teeth in each row of the cookie cutter’s jaw are connected, cookie cutters will loose an entire row at a time, rather than individual teeth. Much like a person with loose dentures on a rollercoaster. The animal will then ingest the teeth which serves to retain some of the calcium levels in the rest of the body. Waste not want not. 5) An animal this marvelous needed to be shared as much as possible and so they graciously evolved into three separate species and spread themselves out as much as possible. 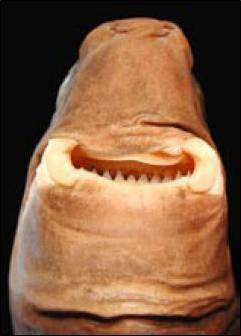 The specimen at the Grant Museum is a cigar cookie cutter shark which is a cosmopolitan species, meaning it is found all over the world. The remaining two species are the South China cookie cutter (bet you can’t guess where that species lives) and the large-tooth cookie cutter, found in isolated populations throughout the world on either side of the equator. In short, wherever you are you can be sure that a cookie cutter shark is not far away. Good news for everybody.